SAN DIEGO: Our motorcycle accident lawyer in San Diego has another tragic accident report from earlier this month. According to California Highway Patrol, 53-year-old Reynaldo Newman of Carlsbad was killed when he lost control of this motorcycle while traveling on Harmony Grove Road in Escondido. Authorities reports that Newman was riding a Honda CBR 900RR east on the 2500 block of Harmony Grove Road when he entered a curving stretch of roadway and lost control, tumbling down a 30 foot embankment and landing in a pile of concrete. Our thoughts and prayers are with Mr. Newman’s family in the aftermath of this tragic accident. As motorcycle accident lawyers, we see accidents like this all too often, and cannot stress enough the importance of safe riding–including careful attention to terrain, proper safety equipment, and riding within one’s skill level. While accidents caused by reckless or negligent car drivers can be completely beyond a rider’s control, solo accidents are almost always preventable. 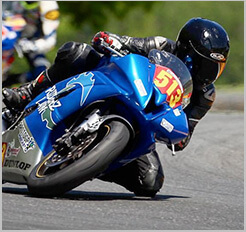 The motorcycle accident attorneys here at Riderz Law implore our clients and readers to ride smart and ride safe.